Government Adda 247 Maharastra Umed Washim Umed MSRLM Washim Recruitment for 71 posts. 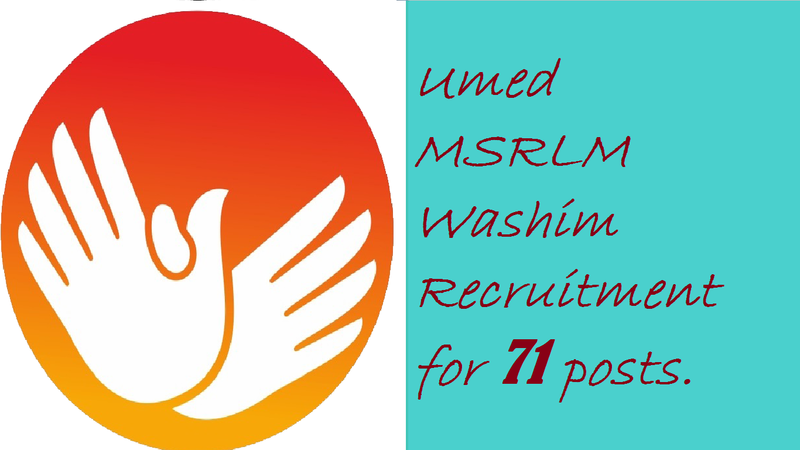 Umed MSRLM Washim Recruitment for 71 posts. UMED Maharashtra State Rural Livelihoods Mission, Washim, Umed MSRLM Washim Recruitment 2018 for 71 Accountant, Cluster Co-ordinator, Administrator Assistant, Admin/Account Assistant, Data Entry Operator & Peon Posts. UMED- Maharashtra State Rural Livelihood Mission, Washim conducting recruitment for various posts. UMED washim recruiting the Number of posts in the District campaign class for the posts of Writers, Administration Assistant, Data Entry Operator, Peon and for Number of posts in the Taluka campaign class Division coordinator, Data Entry Operator, Peon. The total number of vacancies for recruitment are 71. Eligible candidates can apply for this posts. For eligibility, applicants must have education qualification and required experience in that field. Eligible aspirants can apply online for posts. The starting date of online submission of application form is from 5 Sept 2018 till 19 sept 2018. To know more about the recruitment process of UMED washim recruitment check the information which has given below. ➤Pune Mahanagarpalika Recruitment 2018 for 181 Posts. आयु सीमा : न्यूनतम: 18 साल, अधिकतम: 38 वर्ष, यानी कि उम्मीदवार कि आयु कि मर्यादा न्यूनतम और अधिकतम यह दिनांक 3/ 09/ 2018 तक गिनी जायेगी. पिछडेवर्ग वाले उमिद्वार कि आयु 43 साल से ज्यादा नही होनी चाहिये. उपरी आयु सीमा के उमिद्वार कि आयु 45 साल तक होनी चाहिये, और माजी सैनिक कि आयु 45 साल तक होनी चाहिये. 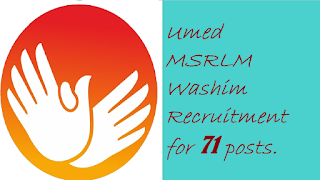 To apply online you have to visit washim msrlm website washimmsrlm.govrecruit.in, we have provided the link above. Fill the all personal information as well as education information on the form. Pay the fees for Open category fees are Rs.374 and for other category, fees are Rs.274. While filling the application online candidate have to keep their documents which are Passport size photo, Signature of candidate and Fee payment receipt all this document must be in soft copy for uploading. No need to upload other than this documents. If the uploaded image is invisible then form may be rejected by the department. After uploading all the document candidates have to submit the application form.